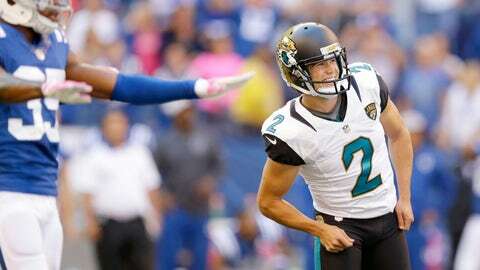 Jaguars rookie kicker Jason Myers has missed three field goals, along with three extra-point attempts. With Jacksonville Jaguars kicker Jason Myers continuing to struggle, the team is reportedly set to bring in some competition during the bye week. Per ESPN’s Mike Dirocco, Jacksonville will host free-agent kickers on Wednesday, though former Jaguar Josh Scobee, whom the team traded to the Pittsburgh Steelers in August, will not be among them. Scobee was released by the Steelers early in the month. The Jags may end up sticking with Myers, but the report states the team wants to get a sense if a better alternative is available. Myers, who beat out Scobee in training camp, has missed three field goal attempts this season, including two potential game-winners against the Indianapolis Colts on Oct. 4. He’s also missed three extra-point attempts, including one in last Sunday’s win over the Buffalo Bills. Jacksonville head coach Gus Bradley told reporters Tuesday he wasn’t sure whether the team would audition any other kickers with Myers continuing to misfire, but added competition is never a bad thing. "Just like everywhere, we’ll continue to look at it and see," Bradley said. "We have competition. We’ll look at some things there and analyze it, and whether they’ll be some guys coming or not, (general manager) Dave (Caldwell) will take a look at that. "Even if guys do come in, does that mean we’re going to go differently? No, but I think you always want that competition."